The OptiX RTN 900 series provide a variety of service interfaces and can be installed easily and configured flexibly. The OptiX RTN 900 series provide a solution that can integrate TDM microwave, Hybrid microwave, and Packet microwave technologies according to the networking scheme for the sites, achieving smooth upgrade from TDM microwave to Hybrid microwave, and from Hybrid microwave to Packet microwave. This solution meets the transmission requirements of 2G, 3G, and LTE services while also allowing for future network evolution and convergence. There are five types of OptiX RTN 900 Packet microwave products: OptiX RTN 905, OptiX RTN 910, OptiX RTN 950, OptiX RTN 950A, and OptiX RTN 980. Users can choose the product best suited for their site. The OptiX RTN 950A is deployed at the access and convergence layers. The OptiX RTN 950A adopts a split structure. The system consists of the IDU 950A and the ODU. Each ODU is connected to the IDU 950A through an IF cable. The IDU 950A is the indoor unit for an OptiX RTN 950A system. It receives and multiplexes services, performs service processing and IF processing, and provides the system control and communications function. The ODU is the outdoor unit for the OptiX RTN 900. It converts frequencies and amplifies signals. The OptiX RTN 900 product series can use the RTN 600 ODU and RTN XMC ODU, covering the entire frequency band from 6 GHz to 42 GHz. The 10.5 GHz frequency band does not support 40/50/56 MHz channel spacing. 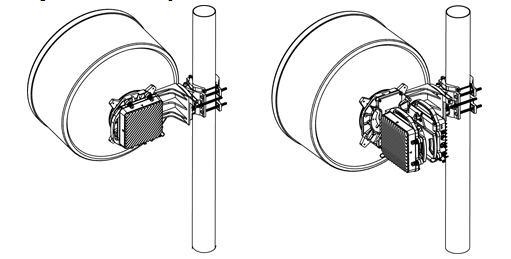 There are two methods for mounting the ODU and the antenna: direct mounting and separate mounting. Unlike conventional SDH microwave equipment, the OptiX RTN 950A has a built-in MADM. The MADM grooms services to the microwave port through cross-connections, maps the services into the STM-1-based or 2xSTM-1-based microwave frames, and then transmits the frames. With this capability, services are flexibly groomed and the optical network and the microwave network are seamlessly converged. The Hybrid/Packet integrated IP microwave (Integrated IP radio for short) can transmit one type among or a combination of Native TDM services, Native Ethernet services, and PWE3 packet services according to software settings. Therefore, the Integrated IP radio achieves a smooth upgrade from Hybrid microwave to Packet microwave. IP microwave can transmit packet services and support the AM function. The packet services transmitted can be Native Ethernet services or packet services encapsulated in PWE3. Conventional IP microwave is divided into two different types: Hybrid microwave and Packet microwave. Hybrid microwave: Native TDM services and Native Ethernet services can be transmitted through the air interface. Packet microwave: TDM services, ATM/IMA services, and Ethernet services after PWE3 encapsulation are transmitted through the air interface. As IP microwave evolves, the OptiX RTN 950A supports Integrated IP radio. As a result, the equipment can support Hybrid microwave and Packet microwave at the same time, and can simultaneously transmit multiple types of services at air interfaces. To achieve flexible grooming of TDM services and packet services on the Integrated IP radio, the OptiX RTN 950A is embedded with dual service planes: TDM service processing plane and packet service processing plane. 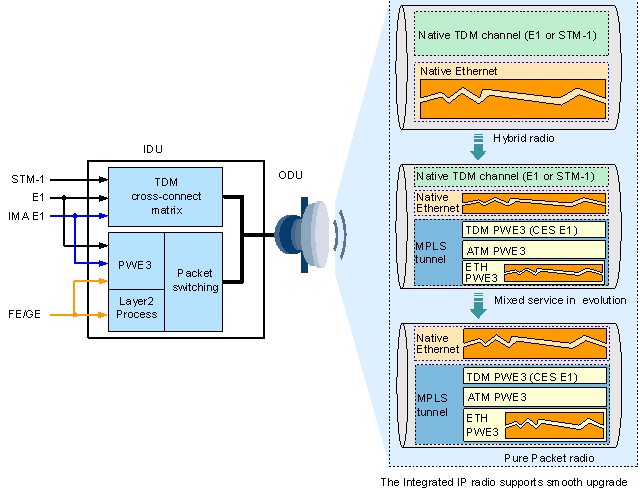 TDM services and packet services can be flexibly transmitted over the Integrated IP radio, as shown in Figure 1. 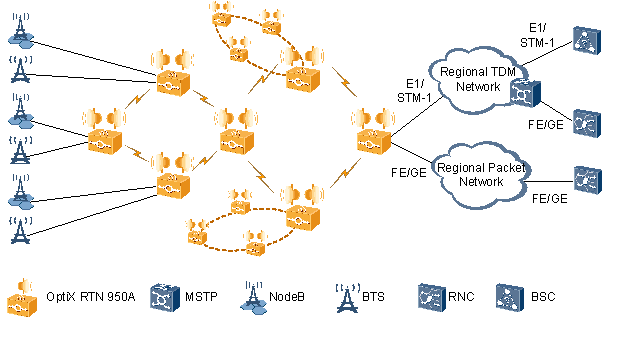 Performs cross-connections on the incoming TDM services (E1 services or STM-1 services), and transmits the services to the microwave ports. Performs PWE3 emulation on the incoming services (E1 services, ATM/IMA services, and Ethernet services), encapsulates them into the MPLS packets, and transmits the Ethernet frames that bear the MPLS packets to the microwave ports. However, Ethernet services can be directly transmitted to the microwave ports in Native mode after Layer 2 switching. Native TDM services, MPLS packets, or Native Ethernet services need to be groomed to the microwave port, encapsulated into microwave frames, and then transmitted on microwave links. TheIntegrated IP radio serves as Hybrid microwave when TDM services are scheduled to the microwave port over the TDM service processing plane and Ethernet services are scheduled to the microwave port over the packet service processing plane; the Integrated IP radio serves as Packet microwave when TDM services are encapsulated into MPLS/PWE3 packets on the packet service processing plane and then scheduled to the microwave port. Transmits one, or several of the TDM services, MPLS/PWE3 services, and Native Ethernet services. Supports the AM function. E1 services and packet services can be configured with priority. When AM is switched to the reference mode, the services with higher priority are transmitted with preference. The OptiX RTN 950A provides several service interfaces on the system control, switching, and timing board, and it is also able to provide a wide-assortment of service interfaces by configuring appropriate service interface boards. Adds, deletes, and switches VLAN tags that comply with IEEE 802.1q/p, and forwards packets based on VLAN tags. Processes packets based on the port tag attribute (Tag/Hybrid/Access). The VLAN ID ranges from 1 to 4094. The E-LAN service supports the MAC address self learning capability in two learning modes: SVL and IVL. MAC addresses can be filtered; that is, MAC addresses can be blacklisted. Static MAC address entries can be set. The capacity of the MAC address table is 16 k (including static entities and blacklist entities). The MAC address aging time can be configured. Supports the MSTP protocol, and generates only the Common and Internal Spanning Tree (CIST). The functions of the MSTP protocol are equal to those of the RSTP protocol. Applies to the FE/GE port and microwave port. Supports load sharing and non-load sharing. The load sharing hash algorithm is implemented based on MAC addresses, IP addresses, or MPLS labels, and supports the specified mode and automatic mode. Supports PLA and EPLA/EPLA+ fucntions. PLA and EPLA/EPLA+ are Layer 1 link aggregation group (L1 LAG) technology, which shares load based on the bandwidth at the physical layer to achieve link aggregation. Physical link aggregation does not use the Hash algorithm and is independent of service flow compositions and therefore makes full use of link bandwidth. A PLA group supports a maximum of two member links. An EPLA group supports a maximum of four member links. An EPLA+ group supports a maximum of eight member links. An EPLA+ group must contain links provided by ISM6 boards. Supports ITU-T G.8032v1-compliant ring network protection for Ethernet services. Disables the remote Ethernet port that is connected to the user equipment when the transmission network or local port fails. QoS Supports QoS. For details, see QoS. Supports the IEEE 802.3x-compliant traffic control function. Supports IEEE 802.1ag- and IEEE 802.3ah-compliant ETH-OAM functions. Supports ITU-T Y.1731-compliant ETH-OAM functions, supports packet loss measurement, delay measurement, and delay variation measurement. Supports IETF RFC2819-compliant RMON performance monitoring. Measures real-time and historical traffic and bandwidth utilization for ports. Measures real-time and historical performance events for DS domains, flows, VLANs, traffics on UNI side, PWs, and egress queues. Measures packet loss due to congestion for flows. Measures packet loss due to congestion for PWs and egress queues. Supports ITU-T G.8261- and ITU-T G.8262-compliant synchronous Ethernet. EoPDH Supported. The EFP8 board provides the EoPDH function. EoSDH Supported. The EMS6 board provides the EoSDH function. Receives/Transmits ATM/IMA E1 signals, and demultiplexes ATM services from ATM/IMA E1 signals. Uses the EoSDH/EoPDH function to encapsulate Ethernet services into SDH or E1 signals. Performs E1/ATM/Ethernet service emulation based on PWE3. Timeslot cross-connect unit Provides the cross-connect function and grooms TDM services. Processes Ethernet services and forwards packets. Processes MPLS labels and forwards packets. Processes PW labels and forwards packets. Maps service signals to microwave frame signals and demaps microwave frame signals to service signals. Performs conversion between microwave frame signals and IF analog signals. Provides the O&M channel between the IDU and the ODU. Provides the system communications and control. Provides the system configuration and management. Collects alarms and monitors performance. Traces the clock source signal and provides various clock signals for the system. Supports input and output of external clock. Supports input or output of external time signal. Provides the time synchronization function. Provides the synchronous/asynchronous data interface. Provides the external alarm input/output interface. Accesses -48 V DC power. Provides DC power for the IDU. Provides -48 V DC power for the ODU. Provides air cooling for the IDU. Converts IF signals into RF signals. 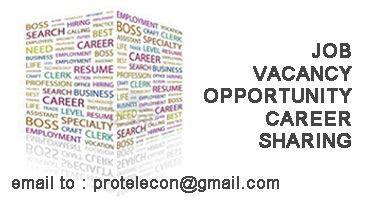 Provides full time division cross-connections for VC-12/VC-3/VC-4 services equivalent to 32x32 VC-4s. Provides the 10 Gbit/s packet switching capability. Performs system communication and control. Provides two-48 V DC power input. Provides the clock processing function, supports one external clock input/output and two external time inputs/outputs. External time interface 1 shares a port with the external clock interface. Provides six GE interfaces, of which four can be only RJ45 GE electrical interfaces, and the other two can be GE/FE optical interfaces or GE electrical interfaces provided by SFP module. The GE electrical interfaces are compatible with the FE electrical interfaces. Uses SFP modules to provide two STM-1 optical/electrical interfaces. When CSHO boards work with MN1 boards, these interfaces can be configured as channelized STM-1 interfaces, which support CES E1s and ML-PPP E1s. Provides sixteen TDM E1 interfaces. Supports 75-ohm/120-ohm adaptive impedance. When CSHO boards work with MN1 boards, these TDM E1 interfaces can be configured as Smart E1 interfaces, which support CES E1s, ML-PPP E1s, and fractional E1s. Provides one Ethernet NM interface, one NM serial interface, and one NM cascading interface. Provides one Huawei outdoor cabinet monitoring interface. The outdoor cabinet monitoring interface shares a port with external time interface 2. Provides one USB interface for software upgrade and data backup. The new SLF2CSHO board is hardware ready for L3VPN functions. SLF2 is the function version. Supports modulation schemes from QPSK to 256QAM. Supports integrated IP radio and SDH radio. The supported service modes are Native E1+Ethernet, Native STM-1+Ethernet or SDH. Supports bandwidth acceleration at air interfaces (Ethernet frame header compression). Supports the EPLA function in OptiX RTN 950A. Supports the AM booster function. IS3: The highest-order modulation mode is 2048QAM. When working in IS3 mode, ISV3 boards can interconnect with each other or with RTN 905. IS2: The highest-order modulation mode is 256QAM. When working in IS2 mode, ISV3 boards can interconnect with ISU2/ISX2 boards. Supports integrated IP microwave and SDH microwave. The supported service modes are Native E1+Ethernet, Native STM-1+Ethernet or SDH. Supports enhanced compression at air interfaces (Ethernet payload compression). Supports the EPLA/EPLA+ function in OptiX RTN 950A. The two IF interfaces can be used together or independently. IS6: The highest-order modulation mode is 4096QAM. The maximum channel spacing is 112 MHz (in witch the highest-order modulation mode is 512QAM). IS3: The highest-order modulation mode is 2048QAM. When working in IS3 mode, ISM6 boards can interconnect with ISV3 baords or RTN 905. IS2: The highest-order modulation mode is 256QAM. When working in IS2 mode, ISM6 boards can interconnect with ISU2/ISX2 boards. Supports integrated IP radio and SDH radio. Available service modes include Native E1+Ethernet, Native STM-1+Ethernet, and SDH. Supports 1+1 protection, which is implemented based on the two IF channels on the board. Supports XPIC, which is implemented based on the two IF channels on the board. Supports 1+1 protection for an XPIC group, which is implemented based on two boards. Hardware ready for the multiple-input multiple-output (MIMO) function. Supports integrated IP microwave in Native E1+Ethernet service mode. Uses SFP modules to provide two STM-1 optical/electrical interfaces. Support K byte transparent transmission. Uses the SFP optical module to provide four channelized STM-1 optical/electrical interfaces. Supports CES E1 and ML-PPP E1 functions for E1s in STM-1 frame. Supports transmission of overhead bytes over CES E1. Provides four GE interfaces, of which two can be RJ45 GE electrical interfaces or SFP GE optical interfaces, and the other two can be only RJ45 GE electrical interfaces. The GE electrical interfaces are compatible with the FE electrical interfaces. Supports the IEEE 1588v2 feature. Provides four GE interfaces, of which two can be RJ45 GE electrical interfaces or SFP GE optical interfaces, and the other two can be only RJ45 GE electrical interfaces and support the power over Ethernet function. The GE electrical interfaces are compatible with the FE electrical interfaces. Provides eight FE electrical interfaces. Bridges to the packet plane through one internal GE interface. Supports the processing of EoPDH services. Supports Ethernet transparent transmission services and Layer 2 switching services. Provides four FE electrical interfaces. Uses SFP modules to provide two GE optical interfaces or GE electrical interfaces. The GE electrical interfaces are compatible with the FE electrical interfaces. Supports the processing of EoSDH services. Provides sixteen 75-ohm or 120-ohm Smart E1 interfaces. Supports CES E1, ATM/IMA E1, ML-PPP E1, and Fractional E1. Provides thirty-two 75-ohm or 120-ohm Smart E1 interfaces. Provides multiprotocol processing and supports CES and ML-PPP. After an MN1 is used, the STM-1 port on the CSHO can be configured as a channelized STM-1 port, and the E1 interface can be configured as a Smart E1 interface. E1 channels in the channelized STM-1 port support CES E1 and ML-PPP E1. The Smart E1 interface supports CES E1, ML-PPP E1, and Fractional E1. MN1 has no ports on its front panel. Provides sixteen 75-ohm or 120-ohm TDM E1 interfaces. Provides thirty-two 75-ohm or 120-ohm TDM E1 interfaces. Provides one orderwire interface, one asynchronous data interface, one synchronous data interface, and four-input and two-output external alarm interfaces. TCU6 6xE1 connector conversion board Slot 1 to slot 6 Provides one DB44 connector and six RJ45 connectors. When being used with an E1 tributary board and an Anea 96 to DB44 transit cable, it converts E1 interfaces 1 to 6 on the Anea 96 connector into RJ45 connectors. Cools and ventilates the IDU. The ODU is an integrated system that is available in several models. The architectures and working principles of the various ODU models are similar. The multiplexer splits the signal from the IF cable into a 350 MHz IF signal, a 5.5 MHz O&M uplink signal, and a -48 V DC power signal. After the up-conversion, filtering, and amplification are completed, the IF signal is converted into the RF signal and then is sent to the AMP amplifier unit. The AMP amplifies the RF signal (the output power of the signal can be controlled by the IDU software). After the amplification, the RF signal is sent to the antenna through the duplexer. The O&M uplink signal is a 5.5 MHz ASK-modulated signal and is demodulated in the CTRL control unit. The -48 V DC power signal is sent to the PWR power unit where the secondary power supply that uses a different voltage is generated and provided to the modules of the ODU. The duplexer separates the RF signal from the antenna signal. The RF signal is amplified in the low noise amplifier (LNA). After the down-conversion, filtering, and amplification are completed, the RF signal is converted into the 140 MHz IF signal and then is sent to the multiplexer. The O&M downlink signal is modulated under the ASK scheme in the CTRL unit. The 10 MHz signal is generated through the modulation and is sent to the multiplexer. The CTRL unit also detects the received signal power through the RSSI detection circuit and provides the RSSI interface. The IF signal and the O&M downlink signal are combined in the multiplexer and then are sent to the IDU through the IF cable.